The scene inside the room both surprises and sickens you. You are in the convent misericord, an area set aside for the sadistic punishment of members of the Order who are perceived to have “gone astray”. 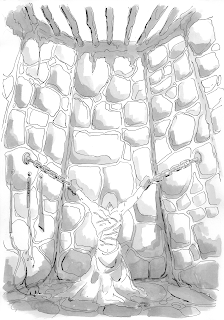 The floor is the same bare stone that the earlier parts of the building were built in, but the walls are fitted with manacles and vicious leather whips with knotted ends hang from loops set into the mortar between the stones of the walls. 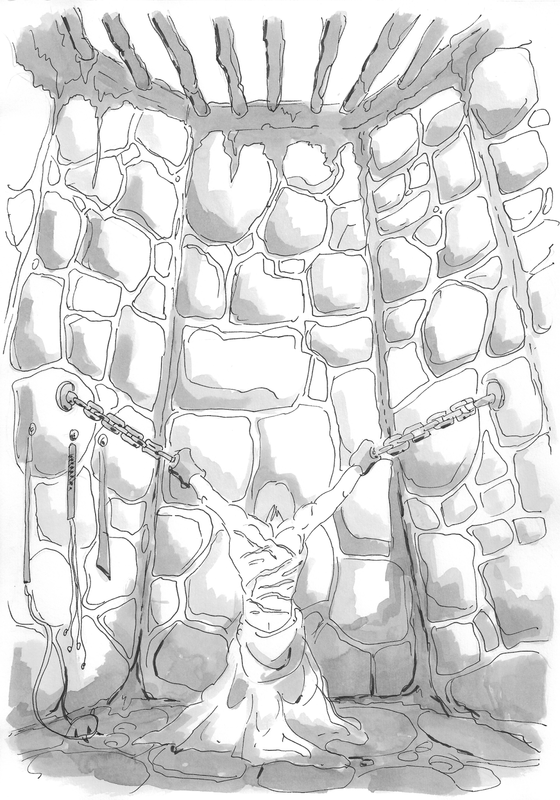 On the far side of the cell, shackled to a fixing post on the wall and facing away from you, is a human female form, stripped down to the waist, her bare back scarred by several vicious welts. As she hears you move, she speaks out, begging you not to flog her again. In your most reassuring tone, you quietly explain that you are not here to hurt her and the girl begins to sob as she requests that you untie her bonds. This is Sister Angela's Veil, the Fighting Fantasy mini adventure, written by Mark Lain illustrated by Simon Walpole. Hidden high in the Moonstone Hills lies an ancient Convent, a site of pilgrimage for those who wish to view the mysterious relic of Sister Angela De Culpa. But, recently reports have come as far south as Salamonis that the relic has gone missing. YOU must journey to the Convent, gain entry, then negotiate whatever pestilence has overcome the building to unravel the secret of the missing relic known as Sister Angela’s Veil.